If you’re wondering how you missed out on Taiko Drum Master Wii 1 & 2 don’t worry, unless you’ve been living in Japan or like myself have an obsession with all things Japanese then you probably won’t have heard of this game. Taiko itself is a form of Japanese Drumming and in Japan the game it’s based on is known as Taiko no Tatsujin, the English name Taiko Drum Master comes from the only western release on the PS2, but the true Japanese title of this game is Taiko no Tatsujin Wii: Minna de Party 3 Daime or 「太鼓の達人Wii みんなでパーティ☆3代目！」 which Google Translates to Taiko no Tatsujin Wii 3 ☆ Generations of Party Together! the title makes a little more sense when you see that they have added mini-games to the popular rhythm action game this title being the third in the Wii series. 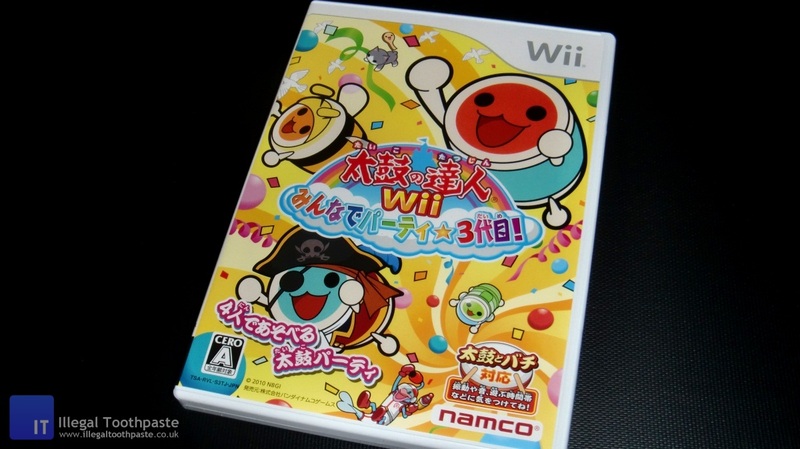 But as the western name makes more sense I will refer to it simply as Taiko Drum Master Wii 3. The original game first showed up in the Arcades of Japan in 2001 and since then many iterations of the game have come out in the arcades and released on home consoles. Other than the Nintendo Wii series, the game has appeared on Sony PlayStation 2, Sony PSP, Nintendo DS and even on the iPad and iPhone but again only in Japan. As I already had a Japanese Wii, I decided to import the first game which was bundled with a Drum Controller and a second Drum Controller sold separately so I could share it with others. I’m a big fan of rhythm action games I played (and got tired of) Guitar Hero and Rock Band and old classics like Frequency, Amplitude, Audiosurf, Vib-Ribbon, Donkey Konga and of course Dance Dance Revolution. For those of you who haven’t played any of those games I’ll just describe the basics for you here, you hit the drum in time with coloured icons flying from the right side of the screen to the left side, Red icons for the centre of the drum and Blue icons for the edge of the drum. You have two sticks to hit the drum with and when you see a large Red or Blue icon you hit the drum with both sticks, you have long notes which require you to drum repeatedly for the length of the icon and other similar icons show up where you hit the drum repeatedly to clear the screen and continue with the song or finish with a bang. As with many games in this genre, sequels usually only update the song library, but to entice people to buy this sequel they have added mini-games called Dream Taiko Land, these can be played with the Drum Controller but since the first two games only supported 2 players at a time, I only have the 2 Drum Controllers but that’s not a problem if you have 4 people playing you can use Wii Remotes instead, or a mix of Drum Controllers and Wii Remotes, the Wii Remotes are held NES-style with the D-Pad under you left thumb and the a and b buttons under your right thumb. These mini-games range from variations on the normal hit the right colour at the right time as seen in the normal music part of the game to hitting the drum at the right time to hop over another player to climb up the side of a cake or to propel your character dressed as a bee towards a flower in the centre. It’s very reminiscent of other party games and even Pokémon Stadium on the Nintendo 64 whereby the main game is battling Pokémon but then the mini-games let you eat sushi with your tongue and get shouted at by a Clefairy, I used to play that game just for the mini-games and I can see myself introducing this game to others with these mini-games. The mini-games are all shown in a menu allowing you to pick which one you want to play then returning you to this menu rather then forcing you to play a game you perhaps don’t enjoy you could even play the same game over and over and all the while you are earning medals for coming in 1st, 2nd, 3rd or 4th place this comes together nicely when you’ve finished playing you can total up the medals you’ve earned for all players which then goes towards uncovering a puzzle piece on screen, I will have to play it some more to see what happens when the puzzle is complete. As in the main music mode each mini-game has 3 levels of difficulty I presume this makes the level harder but also has something to do with the computer players who are added in when you don’t have 4 people playing, making the game more challenging although unlike the main music mode difficulty is applied to everyone, instead of each player setting their own difficulty level. Wani Wani Panic (ワニワニパニック) – In the jungle you defeat alligators by hitting the correct colour drum leading up to it beginning with just one drum, then three and then five, you must hit the drum as fast as you can or the alligator will bite you slowing you down. the round speeds up showing two alligators on the screen at once. Otogi Country Pumpkin Derby (おとぎ国のパンプキンダービー) – You pull a carrage with 3 drum symbols on it hit the correct colour to go faster, occasionally you will get powers up to make you go faster. Haunted House (ホーンテッドハウス) – Similar to the main game drum symbols slide from the right side of the screen and you hit the correct colour when they reach you. As you drum you build up candles but if you start missing symbols then your stock of candles depletes, when you run out it is game over for you. Occasionally your Drum character will appear on top and you must hit the drum repeatedly to escape the skeleton and ghost hands clamouring at you from the bottom of the screen. Pirate Don-chan and the Secret Treasure (海賊どんちゃんと秘密の財宝) – Another mini-game similar to the main whereby you hit the drum symbols in time to build up stacks of gold which serves as your lives, if you miss a symbol your gold supply will start run out when it is depleted the game ends for you. At the end you all group together to fire cannonballs at the giant Squid. Alien Attack (エイリアンアタック) – Waves of enemy’s fall down from above and you must shoot them before they reach you, you can move between 4 positions below them but they are fixed in their falling pattern. When all 4 drums stand on the same spot you fire a super laser that quickly destroys the alien attackers. Todoke Cake Tower to Heaven (天までとどけケーキタワー) – In this game you partner up to climb up the side of a 1000m tall cake by jumping over the other character, but watch out for falling streams of icing during this time hit the drum as quickly as possible to fill the meter and propel yourself further up the cake. The first pair to the top are the winners. It may seem like I just took this list from Wikipedia and you’d be partially right, because I was the one who added it Wikipedia in the first place. Purrrhaps Nintendogs isn’t the only game to get + Cats. Overall I’m pleased to boost the song library once again and will definitely be playing the mini-games and forcing friends to play them too, just so I can find out what happens when you finish the puzzle. This is a great Rhythm Action series and I hope they continue releasing them. Gosh thanks for posting, desperate to get Taiko Drum Master for my daughter and can not believe we do not have one you can play on a European PSp or Wii. Ordered one but luckily the seller asked me if i had a Japanese console otherwise it would not work. Do not fancy paying out all that money just for a console just to play one game. Any ideas? The Sony PSP is region free so if you can get it for the PSP then do that, same with the Nintendo DS versions of the game, sadly for the Nintendo Wii it’s Japanese only.